If you’re looking for a full, rich-flavored coffee that’s a major step-up from instant without the hassle of a drip machine, then a French press may just be the thing for you. This low-tech, portable coffee maker is quick and inexpensive. It also requires no filters or electricity when making an amazing cup of coffee. So what makes the flavor of this type of coffee superior? Science! Drip machines and pour over (instant) push water through the beans quickly, not allowing the hot water to mingle properly with the grounds. Whereas a French press thoroughly steeps the coffee beans, allowing the infusion of the beans and letting them release their essential oils. This slow immersion gives the brew it’s distinctively smooth, buttery taste. If you enjoy a morning cup of Joe, chances are you’ve seen one of these before; you may just not know how one works. It’s actually very simple to use, but like everything in, life you need to tweak it to your taste. The KONA boasts a 3-piece stainless steel infuser filter system, an extra thick clear borosilicate glass coffee pot housed in an attractive outer shell to protect it from chips and cracks. This protective design is one of the key features that sets the KONA apart from other ones on the list. You don’t have to worry about knocking it over and breaking, it’s just not going to happen with this model. The coffee pot brews up to 34 ounces/1 liter which is about 4 mugs of coffee. The handle is sturdy and easy to grip, and the press is easy to clean and dishwasher friendly. The KONA also comes with a coffee scoop and an extra replacement screen. This simple, attractive coffee maker is affordable and will keep you drinking amazing tasting java for years to come. . This French Press has been in the market since the 1980’s and is still going strong. The Brazil has a durable, heat-resistant borosilicate glass beaker and a BPA-free plastic handle and base. It also has a 3-part stainless steel mesh filter. Its patented safety lid prevents the splashing of liquids while pressing. All parts are dishwasher safe to make cleaning a breeze and it also comes in a variety of colors. The Brazil really seems to live up to Bodum’s motto that good design doesn’t have to be expensive. This affordable, simple press will make you the coffee you need, at an affordable price. Considered the Rolls Royce of French Presses, Frieling boasts a double wall of pure stainless steel. A mirror finish on the outside and a brushed finish on the inside ensure that it retains heat 4 times better than a glass press. With a two-stage filter system, the Frieling uses a pre-filter and super-fine mesh filter to guarantee zero grinds in your cup. This durable press is built to stand the test of time; after all, it’s far harder to break a stainless steel coffee maker than a glass one. It also disassembles entirely for washing by hand or dishwasher. This model is available in 4 sizes: 8 oz, 16 oz, 23 oz and 36 oz and is covered under a 5-year manufacturer’s warranty. Frieling is definitely one of the most expensive presses on the market. But many coffee aficionados swear that the end result makes it well worth the price. 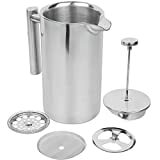 This versatile French press comes as a superior bundle offering, not only the 34 oz coffee maker but also a measuring scoop, a unique design spoon made from stainless steel and 4 Filter Screens. The lid is 100% stainless steel, and the carafe is made from heat-resistant, double German glass. Hard copy instructions and barista secrets are also included in the package. Kitchen Supreme has a solid reputation for customer service. They offer a 5-year warranty with their models, and if something were to happen to it they promise to replace it immediately. 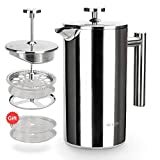 This stainless steel SterlingPro French press compares very highly with the Frieling but comes with a cheaper price tag. Just like its glass version, this coffee maker also boasts a Double Screens System that ensures you’ll get no grounds in your coffee. It has a double wall stainless steel construction that keeps the coffee hot on the inside, while the outside remains cool to the touch. This best-selling model won’t rust and is dishwasher safe to make cleaning it easy. It also comes with 2 extra screens. The SterlingPro stainless steel is a great mid tier option for coffee lovers. 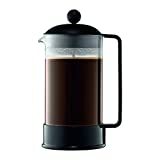 The combination of glass, stainless steel, and plastic makes the Chambord a very attractive-looking French press. The glass and plastic are entirely taste-free, so nothing interferes with the flavor of your coffee and pouring is a joy. The frame and lid are made of steel, which undergoes several chrome plating processes. Their durable, shiny surface is built to last years of intense use. The glass beaker is made of heat-resistant, thick Borosilicate glass. 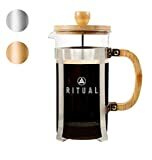 This sturdy French press also utilizes a 3-part filter and comes in every size, from the 12-cup down to the 3-cup. 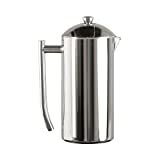 This affordable French press is made from top quality 18/10 stainless steel. Its double wall construction makes it more durable and practical in retaining heat. The Secura has a 3-layered stainless steel filter structure design to trap small coffee grounds. All parts are dishwasher safe, and it comes with an extra stainless steel screen. 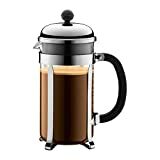 This coffee maker features a lower price range, great for the novice french press coffee maker. The Kuissential is another sleek stainless steel coffee press that is virtually indestructible. You’ll have no qualms stirring the hot liquid with a metal spoon. It has the standard double wall construction with a mirror finish outside and a brushed finish inside. This unique all-glass press has a silicone base that is heat-resistant up to 400 degrees Fahrenheit. It won’t heat the top of your table, and there’s no risk of it sliding across the surface. It’s also kind of cool to watch your coffee brew without any plastic or metal in the way. The Ritual also comes with a lifetime guarantee. French Presses use the medium to course ground coffee beans. You don’t want to use finely ground beans and the reason why is that you don’t want the mesh filter to get clogged with the grinds. So if you’re grinding the beans yourself set it between dip and percolator for best results. Ideally, you want fresh beans that are coarse and evenly ground. Don’t forget to store your ground coffee in a dry, cool place. Third: Too Hot, Too Cold, Just Right! The next step is to add hot water to your grounds. Unlike instant coffee, experts say not to pour boiling water straight into the French Press as it can scorch the grounds. But rather, once the water has been boiled leave it to cool for about 30 seconds or when the water temperature is between 195-200 degrees Fahrenheit. Also, don’t let it cool too much because tepid water doesn’t allow the flavor to be extracted fully. So when the proper temperature has been reached, slowly pour the water onto your coffee. You’ll find some of the grounds float to the top of the water. Let it sit for 30 seconds then stir it once or twice with a long spoon. Place the lid/plunger at the top of your coffee pot in the up position. Now you wait for your coffee to brew. The coarser your grounds, the longer it’ll take to brew. The general rule of thumb is to leave it 3-5 minutes. But some enthusiasts like to brew their French Press coffee for 6-8 minutes. It really boils down to how strong you enjoy your coffee. A good indicator that you’re done is when the coffee grounds aren’t floating anymore, and they’ve sunk to the bottom of the press. Once you think it’s ready, hold the lid with one hand and push the plunger down gently with the other. The mesh screen will push the grinds to the bottom. Take your time with the plunger; it should take you about 20 seconds to get it to the bottom. You don’t want to press the plunger too fast or risk agitating the grounds. The lower you go, the more resistance you’ll feel. If the plunger gets too tight, back it up an inch or two and resume. Tip: If you don’t feel any resistance, then next time use a finer grind. But if there’s too much resistance, use a coarser grind in future. It’s important to note that even though you’ve pushed the plunger down; your coffee will continue to brew. If you plan on having a second cup, you’d best pour the coffee into a thermos or carafe right away, or you’ll end up with over-extracted, bitter coffee. With a French press, it’s always best to make the exact amount of coffee you’re going to drink. Tip: don’t drink the last mouthful of your coffee mug as there tends to be grit at the bottom. Now you have an idea of how to use a French Press; the next step is to go out (or online) and buy yourself one. Of course, there are many products on the market so it can difficult to decide which one works best for you. Luckily, you’ll find many options out there that are both affordable and produce an excellent quality brew. In summary, the French press is a simple, convenient way to get an excellent tasting cup of coffee. Coffee enthusiasts agree that the brew is far more superior than that of the pour-over and drip mechanisms. You can completely customize the brew to your taste as you have absolute control over the infusion time. It’s also worth pointing out that it’s an environmentally friendly brewing method as well since no filters or plastic pods are used or discarded in the process. All of these add up to making these an excellent gift for yourself, or someone you know that loves that perfect morning brew. And always remember practice makes perfect!